Cognex Corporation is committed to supporting a variety of non-profit community organizations in the communities where we operate through our annual donations program. In the U.S., Cognex makes donations to organizations and programs based in Natick, Massachusetts; Portland, Oregon; San Diego, California; and Milwaukee, Wisconsin. 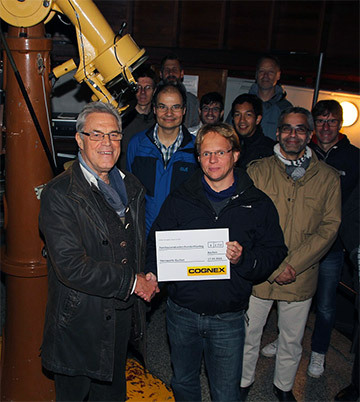 Cognex also makes donations in Aachen and Karlsruhe Germany; Paris; Tokyo; Shanghai; Budapest; Milan, and Cork, Ireland. Contributions made under Cognex’s corporate donations program reflect the company’s philosophy of working hard, playing hard, and enhancing vision. For example, Cognex has given grants that promote education (primarily math and science), such as helping a local elementary school to build computer networks, and purchasing new equipment for a middle school science laboratory and programs that assist the blind and vision-impaired (in recognition of the fact that Cognex manufactures vision systems and sensors). Decisions about the company’s charitable gifts are made once a year. To be considered for a Cognex grant, please download the application form, and email it to Events Manager Marci Blacker: Marci.Blacker@cognex.com by May, 1. All submissions are carefully evaluated, and grants are awarded in June. If you have any questions about Cognex’s corporate giving program, please call +1 (508) 652-3789.